The ability to walk to so many attractions, food venues, and artistic happenings made me very jealous. I love my house but I simply don't have the ability to go places, and more importantly do THINGS without a car. I have a nice path to go running on but I'm a straight, three mile jaunt away from exciting stuff, like a bookstore - a real LIVE bookstore. I think that is where they tell you how to use a Nook. More than JUST density, comprehensive public transportation is critical to a lively community. While there were more cars than I remember in Chicago, bus, bike or walk are clearly the way to go. I live in Washtenaw County, where we are on the verge (well a year away) of a historic vote on the future of transit service in our area. I suppose I could walk to these attractions, but three miles each way adds up. And nobody likes a sweaty runner in a bookstore (is that an old saying?). With expanded service I might have the chance to catch a ride on the bus for that 3 mile straight shot, putting me right in the heart of a corridor ripe for redevelopment and investment. It seems like attracting young twenty something talent like myself would be a good tool for further development. Ah crap, I'm thirty-something now. Guess I'll have to start watching that show. The transit provider in the area has spent considerable resources over the past year or two promoting its Transit Master Plan. Now we're to the point where, as a community, we need to see if we are "forward-thinking" enough to expand to a more comprehensive countywide transit system - you know, like the ones they have in every major city, Detroit, in some ways, excepted. What's best is a public involvement tool being used to gather comments from the community. Check it out here. Ah yes, GIS is everywhere. 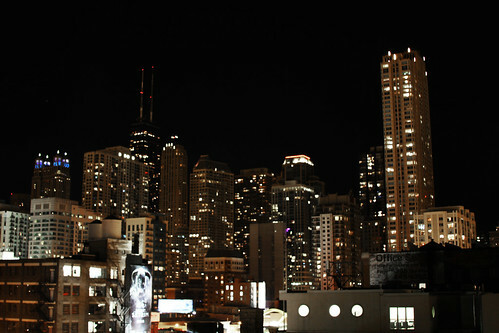 And for good measure, here's a picture of the big city lights that have me itching for an urban lifestyle. In many cities and states throughout the country, the public transit system needs to be changed to ease the growing populations and new development in many areas. With the the use of GIS, citizens could suggest routes, or stops, and developers could use the GIS to see if any suggestions would improve the transit system in a specific city or county.